FARMINGTON HILLS, Mich. – (Oct. 10, 2017) – CCE, a leading provider of advanced interoperability software and engineering services, announced that their latest software Explore 3D is gaining steam and being adopted by users to view CAD data with ease from the familiar confines of Windows Explorer. 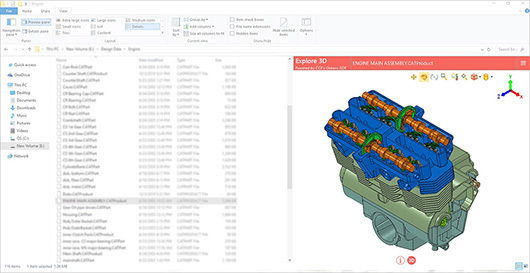 CCE announced Explore 3D last month as a 3D CAD viewer that is convenient, efficient, and free for all users to view CAD data directly inside Windows Explorer. This data includes 3D CAD model, product structure (assembly tree) and all of the properties and metadata associated with the file. Explore 3D users are able to search for and explore 3D files using preview image or metadata. Model information, such as material properties, can be quickly accessed and utilized. Users are also able to check the components in an assembly by parsing through files in Windows Explorer and without having to open each file in the CAD system or a separate CAD viewer. "The engineering world has experienced a significant increase in the volume of rich 3D data in recent years. Companies are also increasingly using virtual storage tools many of which are accessed as a virtual drive inside Windows Explorer. Scanning large number of files looking for specific information using a CAD system becomes cumbersome and expensive. Fortunately, there is an easier way. Explore 3D will help you get the job done using the free Windows Explorer bundled with every copy of Windows,” said CCE’s Vice President of Sales and Marketing, Vinay Wagle. Explore 3D supports all major CAD formats, including CATIA V5, CATIA V6 (3DXML), SOLIDWORKS, NX, Creo, Inventor, Solid Edge, and JT. Users do not need the license of any CAD system, so accessing information is effortless.